As a father you want to stay in close touch with your children, even after you and your partner have separated. Obviously, the best and simplest way to do this is an agreement between you and your ex, which can be made legally binding by solicitors. This means it doesn’t have to go through the courts, and will work when relations between the pair of you are amicable. If you have Parental Responsibility, either by being married to the mother when the child was born, being present when the birth was registered and having your name on the birth certificate as the father, or through a Parental Responsibility Agreement or Parental Responsibility Order, you have rights and responsibilities to your children. Obviously, part of that is support in financial terms, but also in emotional and legal terms, too. In return, you have contact with your children. Family Courts have a principle called “presumption of contact”, under which they have to do everything possible for fathers to see their children. These might seem possibly weighted against you, but the sole intent is for the welfare of the child. In the vast majority of cases – well over 90% – Contact Orders are granted. If it’s come to a hearing, one important factor will be the report by the Cafcass (Children and Family Court Advisory and Support Service) officer. Both parents, as well as other carers and teachers, will have been interviewed, and in most cases the court accepts the report as it stands (although you can challenge part of it or even ask for a new report from a different officer if you disagree). 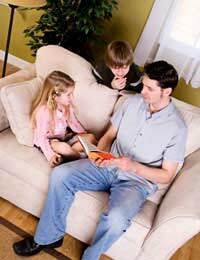 A Residence Order determines who the children should live with. If none has been issued, then the children will stay with their mother. You can apply for a Residence Order to have full custody of your children, but realistically speaking, unless there are pressing reasons they should not stay with their mother, it’s unlikely your request will be granted custody. When you have contact with the children, you should not attempt to take them out of the country without written permission from their mother. Even if it’s for a holiday, this needs to be discussed and permission in writing given. While you have the children, don’t say negative things about your ex-partner. It creates confusion and a bad atmosphere for the children. You have more positive things to concentrate on during your time with them, anyway. Take at look at our article Making the Most of Your Time With Your Child for some ideas about what you can do together. I see so much hurt and pain on these posts. Though you all give me strength as I am not alone in this. I am also going through the pain of not seeing my son 3yrs old. The pain is the worst in the world. It's like living with bereavement. Be strong Dads and don't give up. It's a hard rocky road but it's worth it in the end. It’s to (late for me )but you younger men with (young children)have more off a fighting chance with blogs like this .i can put this behind me now .and officially let go once and for all . I wish I went to (court for visitation )and was more (daughter focused)years ago .but (I wasn’t) it is want is now there is (no bond) I must (let this go now) for my sanity .i grieved for my child it is the (worst experience off any parents life) .but life goes on and what doesn’t kill us makes us stronger .my ex is difficult they all are but . Ok! so since splitting with my ex two years ago she has done pretty much everything she could to have me arrested and is desperately trying to get me incarcerated. Luckily as I have video of all our interactions I've been able to disprove her allegations.So a couple of weeks ago, after months of not seeing my daughter I spend a great weekend with her, we have a lot of fun and my daughter was in tears saying goodbye for the next two weeks.Two days later I get a call from my daughter making allegations of me grabbing her and causing a bruise on her arm, my daughter and her mother actually called the police again, luckily I had witness who confirmed that I hadn't grabbed by little girl. Now my daughter is wanting to see me again and I'm scared to spend time with her alone incase any other allegations are madebut she is refusing to have supervised visits, I'm at wits end I desperately want to see her but I'm scared her mother will manage to convince her to make another complaint to the police. Any advice or thoughts I really need help! I've had my daughter 2 weekends out the month since she was 2. She is know nearly 11. We have had no problems and always have a good time going swimming bowling etc. As from two weeks ago my ex has said she does not want to come and visit me or her step sister. Her mum has thrown accusations along the lines she says you have adult time and she isn't aloud in the front room she has to baby sit her sister who by the way is 8yrs old? And body shaming no idea where that one comes from. However most weekends we take the dogs out go to soft play /swimming etc then pjs and popcorn for a movie on the sofa. I've spoken to my daughter and she cannot answer why she doesnt want to come down. Ive asked what we can changeto make it more comfortable for her and she just says "i dont know". I am beginning to think she is unaware what's going on and possible believes I am the one saying she cant come. So confused as what to do next. Hi. I have recently separated from my wife of 10 years. I am moving into a 2 bed flat where a friend will be renting the small room to help with the finances. Because someone else will be living with me. My ex wife is now saying my children cannot sleep over even though they will be in my room! What can I do? We have a contact order in place o have children live with me when my partner takes them over night he doesn't always have them he leaves them with other people i don't know or know where they are or live he wont let me talk to them ihis time either. Do i have a right to know where my children are sleeping if not at his address and if he is not there with them. Uk. My daughters mother has cut down the times I see my daughter and I hardly see her. We have a good relationship but her mother controls when I see her. Mediation didn’t work and I have now put a court application in to sort out access. My question is if my child’s mother brings up that I have been to jail (nothing child related AND been seen by Social services to confirm I’m ok with having my daughter by myself) will this affect my access? My daughter has stayed with me 1000s of times over night and gone away with me out of town. I’m just wondering what things could go against me if any. I also pay maintenance. My ex is trying to say I don’t call my daughter enough and that’s why I can’t see her... however my ex blocks my number on purpose. I want my daughter every other wkend Friday to Sunday but she is saying sat to Sunday every other wk.. I would also like to share birthdays and Christmas what are my chances? Thanks in advance. @zic.yes I think it is suitable for the (14 year old ).the rest can stay with you .and myex said I couldn’t compromise .as for your daughter meeting the fathers women well just let them meet after a few stays overs they will be like mother and daughter to peas in a pod .she might even like step mummy more then you there is food for thought .ps are you judging the father because he lives in a flat ?.do you live in a mansion on snop hill looking down on the little people living in flats pondering weather it is suitable a father to see his own flesh and blood because of where he lives ? Does anyone know if it is considered acceptable for 4 children aged 6, 10, 12 and 14 to stay regularly for weekend overnight visits in a 2 bed flat with their father and a partner they never met. @vincent- @alexis - many mothers have issues about handing over their child to a parent the child is not familiar with, especially when the child is very young. Alexis doesn't have to justify any reasons why she doesn't drive. If she doesn't drive it is up to both the parents to try and work this out between them. You shouldn't jump to such knee-jerk conclusions Vincent. @vincent Firstly I never learned to drive, I have provisional and am planning to learn soon (finances allowing). Secondly, try keeping your own emotions about situations to yourself, to imply that the only reason I have trust issues or can’t drive is due to a medical issue or disability is incredibly insulting to those who suffer such things and is a stupidly ignorant statement. I am not using control as a weapon, my child’s father is welcome to see our child any time he likes. I’ve offered to allow him to stay in my house with our child (as I feel this would be better for our child) for a couple of nights whilst I stay somewhere else if necessary. My issue is with my child being taken out of his preferred environment and routine at such a young age. @alexis.you [don't drive] do you have a medical issue or disabled ?is that why you have trust issues about handing your baby over ?or is it a control thing a weapon ? @shezza .its wonderful hun that your child has a great step daddy .you best keep him away from the bio father drugs are no no and raided oh my god what a out law .i would keep my child away from that i would tell police and get social involved .there is no way i would allow my child around that .get step daddy to protect your family like man . @leo.people think i am autistic you no why because i never went legal or to court for my daughter and i rejected my x with good reason .i didn't[ want to be with her ].the reason i didn't go legal was because i was in that much[ trouble ]and made the choice to live the life i want and if that bothers people or they think i am autistic well good for them not everyone will like you .i just made the choice to change and will not have any part in the life i use to live or associate with people who i think bring nothing but drama into life wanting me to snap and carrie on like a pork chop . easy fixed in my view just wipe the lot start again . I'm only 2 months pregnant and my relationship has ended badly. I'm planning on keeping the baby but I'm worried about how access will work with a new born baby. I understand the baby seeing its father is very important but i will be breastfeeding and long times apart in the first few months from the mother is not good for the babys routine and bonding. My ex partner lives 1 hour away and has access 3 days a week to his serverly autistic son 14 years old. His son can be unpredictable and I'd worry if my baby was around him. In addition his son needs constant supervision so I wonder how he could care for the baby. Also I'd worry if he could care for a new born as his ex partner cared mostly for their son when he was a baby. Any advise would be appreciated. I have recently found out that i’m A father of a 9 year old that I never met and was told wasn’t mine at birth. I did the honourable thing and did a paternity test with no objections through CMS. I’m the father of a child I never met and the mother claims i’m Still not and if I ever do he will not know i’m The father. I’m seeking legal advise this week but please help and advise on CMS payments and my rights. Do I have any? Do I have to pay if the mother as said above and says he’s already got a father. She said before the test she wanted the truth and me and the wife agreed i’d get it done as the mother did not tell the truth on due dates etc. You may be able to apply for a special expenses variation via CMS, please see link here. You would have to refer the matter back to court. If you do not have the address, then you can apply for a C4 form. This is an application for an order for disclosure of a child's whereabouts, please see link here. If you fill in this for along with the C79 enforcement order form it means the courts can put a trace on your child in order to allow you to bring the matter to court. Split up with my ex in May of 2016 while she was in early stages of pregnancy, she cut ALL contact with my family members too, fast forward 16 months & we were back in contact, I was travelling 2 & a half hours by train each week to see my son, however I felt strangely like she didn’t want me near the house. We were constantly walking around going for lunch/coffee which wasn’t sustainable financially. I found out in March that I wasn’t allowed near the house because her 11 year old daughter had decided she no longer wanted to see me. Admittedly I have had a gambling problem which I am trying to cut out (signed up to gamstop) she is using this against me & has said no to overnight access 1 night a week. I don’t know wether to bypass 1 day a week with no overnight & apply for supervised.Post is a bit rushed, my mind is all over the place & im scared as this is my first child & therefore the first time I’ve had to deal with anything like this. In a case such as this, you may wish to join our Separated Dads forum in order to speak to our dads who have been through similar before. The main thing in your favour here is that you are getting help to overcome your gambling addiction. The forum advisers, may suggest that you apply for more and be willing to accept less, rather than apply for supervised and wish you would have applied for unsupervised. It may be the court would grant you supervised access for a time, leading to unsupervised when various conditions have been met. Split up with my ex in May of 2016 while she was in early stages of pregnancy, she cut ALL contact with my family members too, fast forward 16 months & we were back in contact, I was travelling 2 & a half hours by train each week to see my son, however I felt strangely like she didn’t want me near the house. We were constantly walking around going for lunch/coffee which wasn’t sustainable financially. I found out in March that I wasn’t allowed near the house because her 11 year old daughter had decided she no longer wanted to see me. Admittedly I have had a gambling problem which I am trying to cut out (signed up to gamstop) she is using this against me & has said no to overnight access 1 night a week. I don’t know wether to bypass 1 day a week with no overnight & apply for supervised. Post is a bit rushed, my mind is all over the place & im scared as this is my first child & therefore the first time I’ve had to deal with anything like this. Much depends upon what the court order states going into the future. If you want unsupervised access you would have to show, prove to the courts that you are a different person. In your case, some initial legal advice may be worthwhile in order to assess whether you have a case to refer the matter back to court.